Well, here we are again; the last few weeks running up to Christmas. Some, probably most to be fair, grab this particular baton around October and belt headlong towards the twenty-fifth of December. The preceding months are merely practice for this, the main event, where those who spend the most ‘win’, and last minute shopping on Christmas Eve gets used by the SAS and Marines as a training cycle in urban combat. 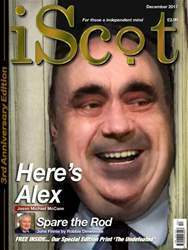 iScot Magazine December 2017 116 jam packed pages of the best craic in Scotland from the only truly independent pro Scottish magazine. Is the art of political prediction dead?